Obtenez ce transfert de bail pendant 22 mois pour des paiements mensuels équivalents U 812.51$/Mois +Tx apr s incitatif. Vous pourrez rouler 4,000 Km par mois. 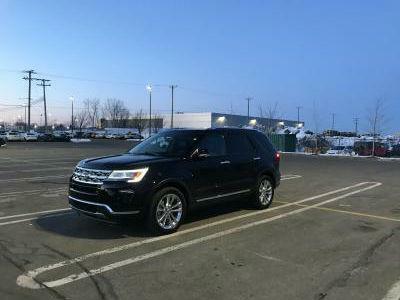 Ford Explorer Limited 2018 Fermer la fentre. Brand new. Includes rubber floor mats for front and rear including rubber trunk tray. 300A equipment group option. Twin panel moonroof, roof rails, privacy glass for rear windows. 110V outlet, ambient lighting, rear view mirror (day-night), heated and cooled front seats, power liftgate, keyless entrypad on drivers side door, reverse sensing and camera system, sync 3, voice-activated navigation, remote vehicle start (from keyfob and through mobile app), rear inflatable seatbelts, 20” polished chrome alloy wheels, trailer tow package. Including never used brand new winter tires and paying the transfer fee at Ford.